When it comes to playing the old NES I prefer the old tried and true method of a controller. On very rare occurrences would I ever want to use a joystick, but if I do I tend to use an Advantage. But it seems that the market was flooded with third-party joysticks for the NES. Were any of them good? Well today we’re going to be giving the Beeshu Zinger a try. Much like its sibling, the Beeshu Zipper, the Zinger was available in many wild and zany color combinations. The Zinger was also an officially licensed product by Nintendo, but I don’t think the Zinger feels as nice as some of its competitors. 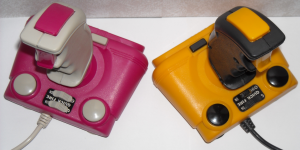 The base of the Zinger has four suction cups to secure the joystick to any flat surface. The base is also where you’ll find both A buttons, independent turbo switched for A and B, as well as the Select and Start buttons, around back of the joystick. Protruding from the center is, obviously, the joystick with both B buttons. Now you’ll noticed I said A was on the base and B was on the stick. This leads me to believe the Zinger was meant to be ambidextrous, allowing the player to use it either left or right handed freely, while also giving them two options for the B button. While testing the Zinger I tried games like Galaxian and actually enjoyed myself. I’ve never been a fan of arcade style shooters, and perhaps that’s why I’ve never enjoyed joysticks, but using the Zinger with Galaxian kind of made me feel like I was at an arcade. I also tried Super Mario Bros. with far less enthusiasm as I found while testing it with a good old space shooter. For platformers the Zinger isn’t horrible, it just might require more practice than I’m willing to give it. Being so familiar with the simplicity of a controller and switching to the more demanding joystick wasn’t much fun, but again it did the job, I just didn’t enjoy it as much as I did the previous game. The Zinger is actually surprisingly comfortable to hold in your hand and use. Also, as previously stated, there are four suction cups to plant it onto a flat surface, if you so choose. How you use the Beeshu Zinger is entirely up to you, but it’s nice to see that they included that option. Even though the Beeshu Zinger is an officially licensed product I’m not really happy with the overall quality. 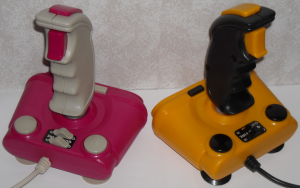 The plastic kind of feels cheap, even for its day, and my yellow and black joystick reminds me of an N64 analog stick; kind of loose and sometimes it doesn’t function quite right. Perhaps I should give it a break for being over twenty years old, but either way I’m still not fully converted to using it over the NES controller or Advantage joystick. Regardless, they do look really nice displayed on a shelf. Being the youngest sibling usually relegated you to using the cheap, third-party controller that hardly ever worked. 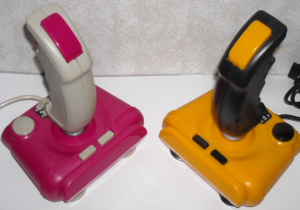 Even more so if you went to your friend’s house and they handed you some strange controller nobody had ever heard of. Well it seems Beeshu Inc. knew that feeling all too well when they designed and created the Beeshu Zipper. 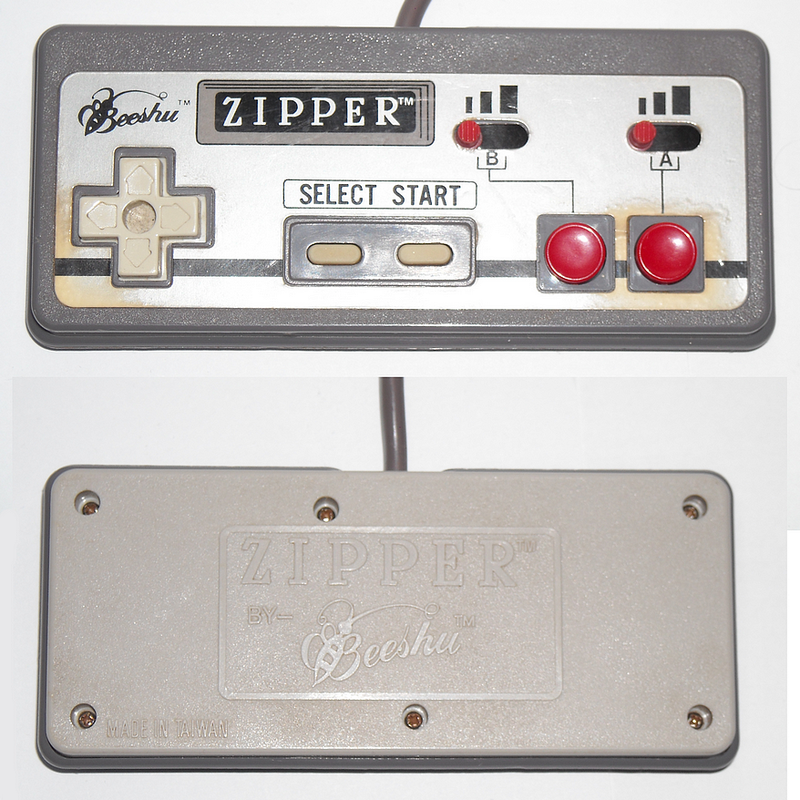 At first the Beeshu Zipper looks like your standard third-party turbo controller for the NES. That is until you realize this was an officially licensed product and was held to much higher standards, which are easily noticeable in the quality of this controller. The Zipper was available in a variety of colors, most of them being 1980’s LOUD colors, but were also available in a pretty standard, two-tone, dark grey on light grey. 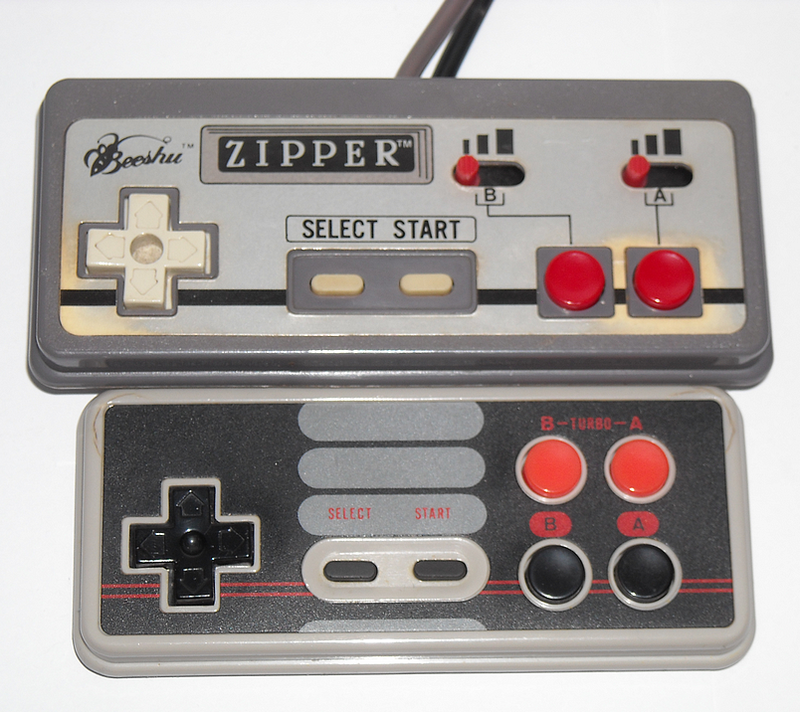 Many third-party controllers of the time used the Famicom controller as their base, and the Zipper was no exception. However, the Zipper feels much more rigid with a textured front and back, which I think helps with gripping the controller. 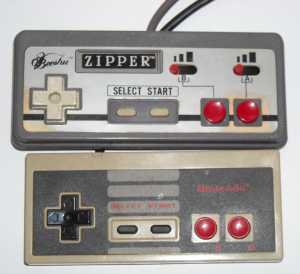 The Zipper is also slightly larger than both third-party and official NES controllers, making it more comfortable for larger hands than its counterparts. 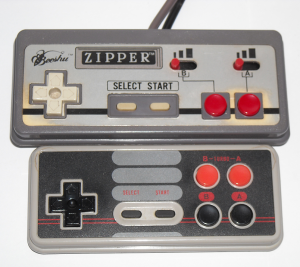 The main defining feature of the Zipper are the two switches over the A and B buttons giving the player the choice of which button they needed turbo for, as well as allowing them to choose between two speeds of turbo or turning it completely off. Both turbo settings are useful, but personally I find the difference between them to be very slight. My only real complaint about it would be that the switches are quite difficult to switch back and forth, but they still function. One thing I’ve always disliked about third-party NES controllers was that the plugs never fit quite right into my NES console, but since the Zipper is an officially licensed Nintendo product it has an official NES controller plug on the end for a perfect fit. In terms of reliability I can say that I’ve owned mine for over seven years and always had it packed away, but when I pulled it out to test it for this article everything still worked as if it were brand new. That’s far better than most of my other third-party NES turbo controllers. 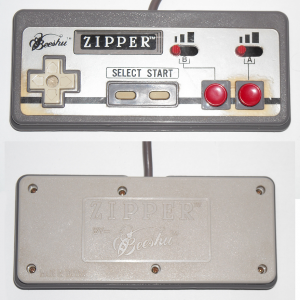 With the rounded off edges of the Famicom controller, the tried and true NES familiar button layout and an over nine foot long cord, let’s not forget the official plug on the end, the Beeshu Zipper would be an OEM killer in my mind. It’s comfortable to hold, it still functions after being packed away for many years, as if it was brand new, and if you happen across one of them in the bright 80’s colors, you’re in for a great time as player two when your friend or older siblings hand you this controller.